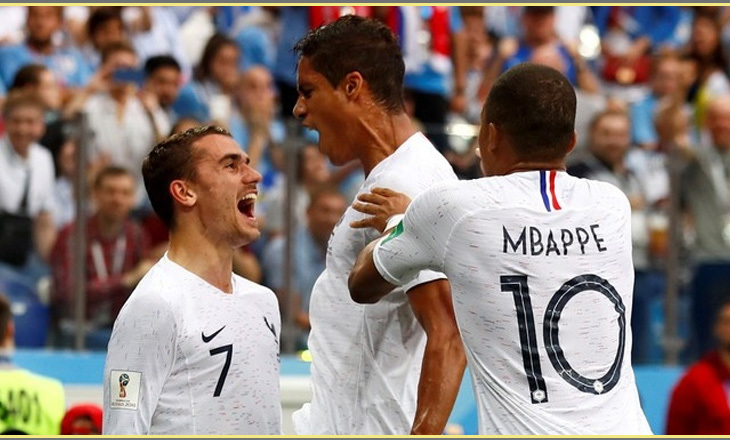 France became the first team to reach the World Cup semi-finals as goals from Raphael Varane and Antoine Griezmann gave them a deserved 2-0 victory over Uruguay on Friday. It is the first time France have been in the last four since 2006 and sets up a mouth-watering clash against either Belgium or Brazil, who play later on Friday, in St Petersburg on Tuesday. It was only the Real Madrid player’s third goal for France and represented redemption for Varane, who was largely blamed for the goal which saw France lose at the quarter-final stage to Germany four years ago. It was Griezmann’s third goal of this World Cup, but his first not from a penalty. That goal secured the victory but did not end the drama in Nizhny Novgorod, as Uruguay’s frustration boiled over in the 67th minute when Kylian Mbappe fell to the floor. Increasingly, Suarez vented his frustration with Argentinian referee Nestor Pitana, who, coincidentally, was the official in charge of France’s quarter-final 2014 defeat. The Barcelona star was partnered by Cristhian Stuani after a week of will-he-won’t-he speculation surrounding Cavani ended up with the Paris Saint-Germain striker failing to recover from a calf strain. The French skipper saved superbly with one-hand from defender Martin Caceres, whose header from a free kick look destined to go in.